His eminence called to involve Iraq in the tripartite summit and the tripartite meeting with Turkey, Iran and Russia on Syria, stressed keeping the momentum to eliminate terrorism and not allow it to take its breath, and indicated the importance of coordination, exchange of information and increase the level of security and military readiness. His eminence stressed developing bilateral relations between Iraq and Russia, pointed the need to invest common opportunities and common interests between the two countries, highlighted that changes in Iraq including mandating an independent personage to run the government, the formation of unbiased alliances under national context. His eminence explained the vision of Iraq being excluded from the regional and international axes, and that Iraq would not be a platform to threat to neighboring countries, but willing to be a place for meeting and convergence of views, and expressed hope that the coming period will witness a visit by Russian President Vladimir Putin. 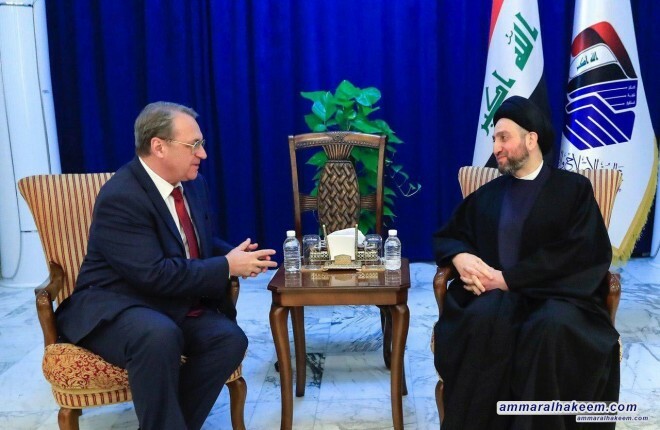 Mr. Bogdanov emphasized on continuing communication with Iraq, and indicated that Russia gives positive considerations to Iraq and seek developing relations on all levels.